The newest Perl features, such as enhanced regular expressions, multithreading, the Perl compiler, and unicode supportThe Perl 5 Pocket Reference, 3rd Edition, is the perfect companion to the authoritative books on Perl published by O'Reilly & Associates:Programming Perl, Learning Perl, and the Perl Cookbook. 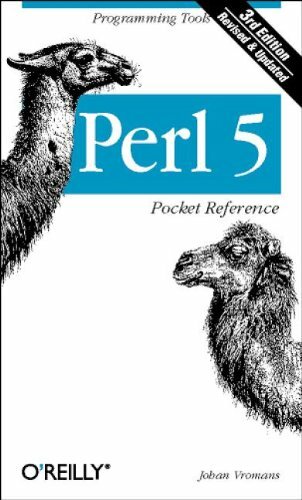 from Oreilly & Associates Inc (June 1, 2000); titled "Perl 5: Pocket Reference"
About: Revised to cover Perl Version 5. About: An updated reference provides a complete overview of the Perl programming language, including a summary of Perl syntax rules, a list of standard library modules with brief descriptions, a precedence table for Perl operators, and more.